ProMedica, a large healthcare system in northwest Ohio and southeast Michigan with multiple buildings and locations, has committed itself to energy efficiency upgrades adding new technology and replacing outdated and inefficient equipment with new to ensure the lowest cost of operation. The Bixby Hospital campus is a ProMedica-owned property in Adrian, Michigan. 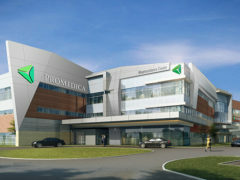 GEM Energy’s HVAC, plumbing and mechanical expertise is helping ProMedica reach its energy efficiency goals. One recent example is a boiler system replacement at the Wolf Creek medical office building located on Bixby’s campus. As part of the project, a standard water heater was replaced with an indirect water heater, which works with the new boilers to heat both the 14,000-square-foot building and the make hot water. With the installation of a new mixing valve that regulates water temperature to not exceed 110 degrees, the hospital is gaining additional energy savings. Reworked piping fixed existing leaks and prevents future ones while newly added check valves on the circulating pumps allows proper system operation. The new GEM Energy-installed boilers (left) are 95 percent efficient. The old boiler system (right) was less than 75 percent efficient.